Wie konkret? Unsere Diskussionen sollen explizit weder akademische Debatten, noch Vorlesungen, Konferenzen oder Tagungen ersetzen. Auch die physische Anordnung der Teilnehmer unterscheidet sich von der üblichen Reihen- vs. Podium-Struktur. Wir bemühen uns, ein breites Publikum zu erreichen und heißen alle Berufsgruppen, Rentner, Arbeitssuchende, Studenten usw. gleichermaßen willkommen. Wir suchen die Kontroverse und positionieren uns politisch nicht. Bisher fanden die Diskussionen mit je ca. 20 bis 100 Teilnehmenden statt. Wir wollen Menschen ins Gespräch bringen, die sich durch unterschiedliche Weltanschauungen, Prägungen, soziale Milieus und fachliche Hintergründe nicht begegnen würden. Wir versuchen gerade bei schwierigen, kontroversen politischen Themen durch die Debatte, gemeinsames Vokabular zu entwickeln, um ‘den anderen’ besser zu verstehen. Die Expertise der Referenten und vieler weiterer Teilnehmer trägt dazu bei, dass die Diskussionen nicht etwa einfachen ‘Stammtischgesprächen’ gleichen, sondern substantiell geführt werden. – in Helsinki in englischer Sprache: z.B. the Ukraine crisis, drones in warfare, TTIP, the Finnish welfare state, electronic surveillance, the EU’s financial crisis, the Syrian war and Polish political history. Renommierte Persönlichkeiten nahmen bereits an unseren Diskussionen teil: U.a. Der ehemalige Minister für Internationale Entwicklung in Finnland Pekka Haavisto, der international renommierte Anwalt und Rechtswissenschaftler Martti Koskenniemi, der ehem. japanische Botschafter in den USA und President der American-Japan Society Ichiro Fujisaki, Fernsehkorrespondent Tom Kankkonen, Top-Diplomat Tim Hemmings und Professoren wie Teivo Teivainen und Timo Kivimäki. Wir kooperierten bereits mit der Universität Helsinki, dem Finnish Institute of International Affairs, der Britischen Botschaft in Helsinki, der Japanischen Botschaft in Helsinki sowie mit Finnish Model United Nations. In Berlin konnten wir u.a. bereits Prof. Dr. Klaus Segbers, Heino Wiese und Barbara Lehmann gewinnen. Discussing World Politics is a forum that offers a platform for debate beyond the usual conference and lecture format. We host discussions in Helsinki and since recently also in Berlin on matters of international politics where audience and speakers have the chance to interact, meet representatives from academia, media, pol itics, business and civil society and express their thoughts about political issues. DWP aims to start a thought-provoking and critical political conversation by bringing together a variety of people from different disciplines with opposing opinions. We create space for a dynamic interaction between students, professionals, academics and the public at large. Our discussions are accessible and inclusive as well as free of charge.We challenge the lecture format and the hierarchical demarcation between the speakers and the audience. By this we empower the audience to partake in the conversation and engage with the speakers more openly and in depth. Discussing World Politics is our contribution to a politically active civil society and democratic participation through deliberation and debate. There were a lot of people who had spend their energy into making dwp possible. 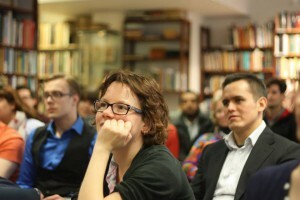 Since its first discussion, attended by five people in a Finnish pub in late 2013, dwp grew to a dynamic platform with changing committed Board members, prominent speakers and sometimes up to 120 participants on a bi-weekly basis. Our concept of a forum resonated and called for continuance beyond the city of Helsinki. About once a month the DWP organizing team chooses a topic of interest to discuss. 1 to 3 speakers/panellists are invited to give insights on the topic prior to the discussion. The moderator introduces the panellists and the topic at the beginning, then each panellist introduces the topic in 10-15 minutes before we open the floor to all. We usually dedicate over 90 minutes of the event to the discussion. The speakers elaborate more on the topic during the discussion. Everyone is welcome to express their opinion, make a statement, test an argument or pose a question. Since the turn-outs at our events have grown, we cannot always have the discussions entirely free of rules. Requests to speak can be signalled to the moderator by a side glance or by raising your hand. Participation in the discussion is not obligatory. No one is pushed to speak. 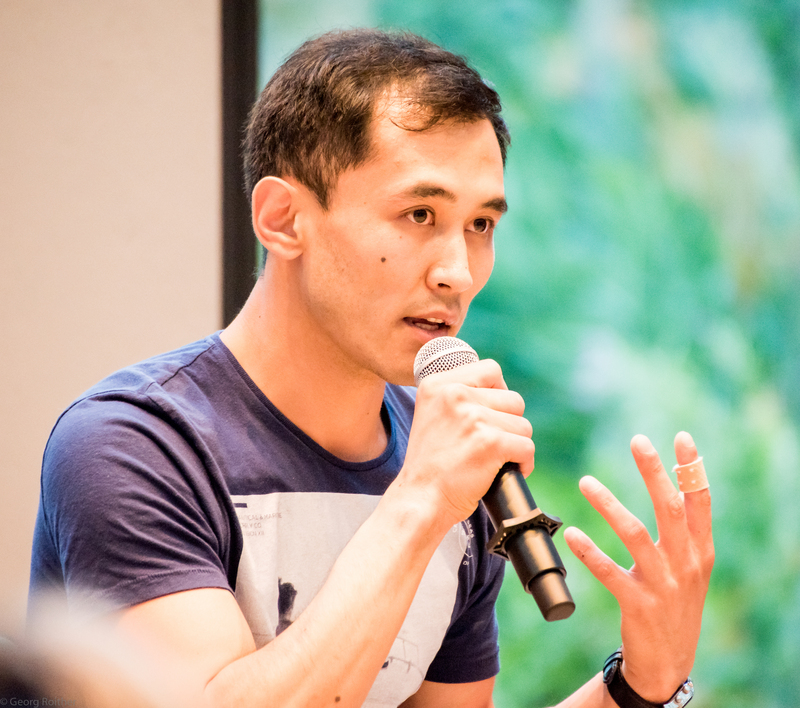 This format becomes especially interesting when the panellists are high-level decision makers or professionals because it provides a unique opportunity for the audience to engage closely with people they would otherwise not have a chance to meet. We believe that the emphasis we put on the discussion part distinguishes us from the standard university or public lectures and creates a unique and informative interaction. The topics we covered included: the Ukraine crisis, drones in warfare, the TTIP, the Finnish welfare state, electronic surveillance, the EU’s financial crisis, the Syrian war and Polish political history. Some of our guest speakers were Pekka Haavisto, international law professor Martti Koskenniemi, former Ambassaor of Japan to the US and President of the America-Japan Society Ichiro Fujisaki, YLE Correspondent Tom Kankkonen, and professors like Teivo Teivainen and Timo Kivimäki. 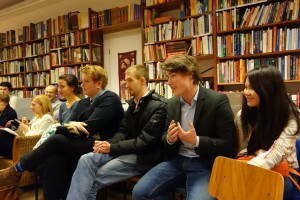 We organized events in cooperation with the University of Helsinki, the Finnish Institute of International Affairs, the British Embassy in Finland, the Embassy of Japan in Finland as well as the Finnish Model United Nations (FinMUN).